How NOT to Write a book: 200 Mistakes to avoid at all costs if you ever want to get published. There’s a whole industry set up for those writing books and offer sound advice on how to write well. This is not one of those books. On the contrary, this is a collection of terrible, awkward, and laughably unreadable excerpts that will teach you what to avoid – at all costs if you ever want your novel published. 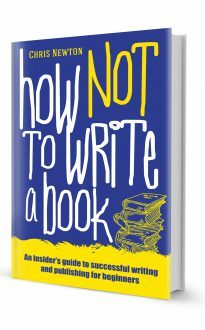 In How Not to Write a Book, authors Chris Newton and Antonia Tingle distil their 30 years combined experience in publishing, editing, writing, marketing and reviewing fiction to bring you real advice from the other side of the query letter.